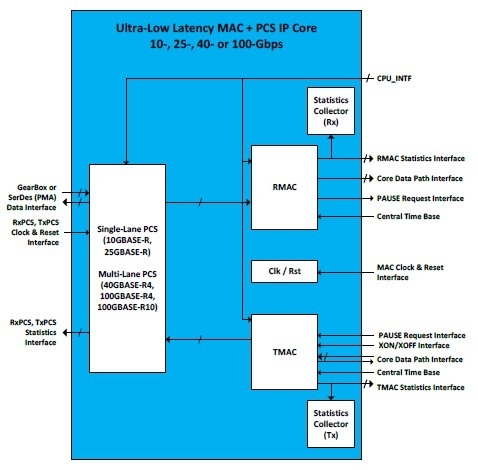 The Ultra-Low Latency Ethernet MAC and PCS is the ideal core for latency critical applications. These IP cores are designed to minimize congestion, to eliminate high fan-out nets, and to reduce the number of pipeline stages required to a theoretical minimum. The cores are highly scalable and can easily be customized to target any speed, technologies and process nodes. The Ultra-Low Latency Ethernet MAC and PCS is the industry leading solution for latency critical Ethernet applications such as high-frequency trading and data center Ethernet switches. The core is designed using advanced techniques leading to unmatched, ultra-low gate count utilization and amazing latency performances. The IP core can be generated to operate at 10-, 25-, 40- or 100-Gbps line rate. Standard 40GbE XLAUI or 100GbE CAUI external interface consisting of serial transceiver lanes operating at 10.3125Gbps, or the CAUI-4 external interface consisting of four serial transceiver lanes operating at 25.78125Gbps. Supports 40GBASE-R4, 100GBASE-R4, and 100GBASE-R10 PHY based on 64B/66B encoding with data striping and alignment markers to align data from multiple lanes. High performance configurable core data path interface at 32-bit (10G), 64-bit (25G), 128-bit (40G) and 256-bit (100G).